The neroli essential oil blend is extracted from the fresh picked blossoms of the bitter orange tree. It is grown commercially in Italy, France, North Africa and Sicily, this essential oil sold on Powells Aromatherapy is from Tunissia. Neroli essential oil was first discovered in the late 1600s and is said to be named after Anne-Marie, Princess of Neroli, in Italy. Brides have often carried the neroli blossom to calm there nerves, after the Roman god Jupiter gave an orange to Juno when he married her. The neroli essential oil has an aroma that is true to nature, wonderfully, bitter-orangey blossom, calming and relaxing. 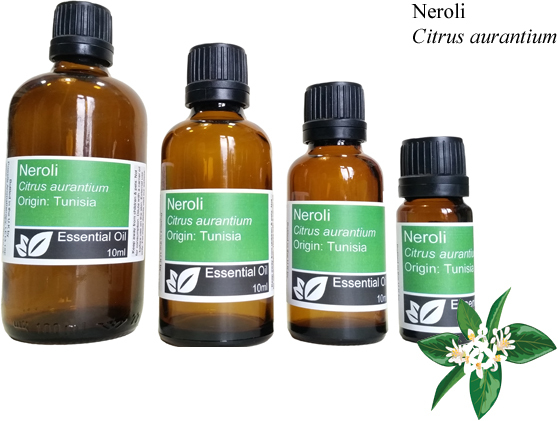 Neroli Tunisian absolute oil we sell below is the same oil used to make this diluted neroli oil, but this one is diluted in 95% grapeseed oil (vitis vinifera). This is just down to the cost of the absolute oil and makes the cost of this oil much more affordable than the pure absolute neroli essential oil. Diluted absolutes are still very strong scented and ideal for use in aromatherapy and home blending and fragrancing your home, great for use in an oil burner, fragrancer and making purfumes. For a full description on the neroli oil, please see the descriptian above. Plant part used: Neroli essential oil is obtained from the flowers and petals of the orange tree. Extraction: Neroli oil is usually produced using the enfleurage method, sometimes the neroli essential oils are also obtained by steam distillation, the oil is thick and deep brown in colour. Aroma: When neroli is in its concentrated form the fragrance is not always liked, but when it has been diluted, its is one of the most beautiful of all essential oils used in aromatherapy. The oil has a beautiful floral fragrance. Properties of Neroli Essential Oil: Antidepressant, antiseptic, aphrodisiac, deodorant, digestive, tonic, emollient, sedative. Very relaxing and soothing oil, said to help in the relieve of anxiety, depression and stress. Instills a feeling of peace. Helps mostly with dry, sensitive and mature skins. Blends well with: basil, camomile, bergamot, cedarwood, carrot seed, frankincense, geranium, jasmine, juniper berry, clary sage, cypress, lavender, myrrh, patchouli, petitgrain, veticver, ylang ylang, rose, lemon, and myrtle.